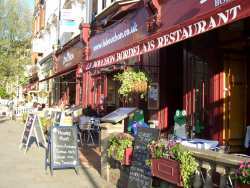 Discover 'Le Bouchon Bordelais' in Clapham Junction! The best of French gastronomy within minutes of Central London? This is a bet that The Bouchon has been prepared to ''place''. 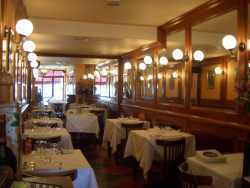 Trained at the famous Gavroche, the chef, Eric Landeau, delights the connoisseurs. For a very short time, he has been offering a very good value for money lunchtime menu. Fine cuisine at a reasonable price, one has to try it to believe it; this is what I have done. French songs playing in the background, 50s ads on the walls, a French speaking staff, everything is there to create the look of a ‘Parisian Brasserie’ of the Gauloise Years. You can easily forget that outside the fog replaces the frogs. 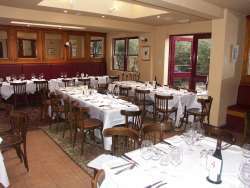 The menu, which is changed every week, is an invitation to discover French traditional cooking. The "à la carte" menu puts forward seasonal products such as sea bass which is the in season fish until September. The ingredients are carefully selected, the vegetables come from farms, the meat is from Scotland and most of the rest form France. So what’s the difference between cuisine and gastronomy? A salad Mesclum, lardoons and poached eggs with a touch of art. Swiftly followed by an oyster mushroom and asparagus risotto which has pleased my senses no ends. The chocolate mousse is traditionally difficult to get right. But at Le Bouchon, it is simply perfect and precisely as I like it: firm but not too sugary and with a strong taste of chocolate. Something that most parents with young children will appreciate is the babysitting service available whilst they are having a peaceful lunch. The restaurant : Monday to Saturday midday to 11pm and 12.30 pm to 10.30 pm on Sunday. Set lunch: Monday to Friday from midday to 3pm.